So what’s that they say about the best laid plans, the road to hell, good intentions, yadda yadda? Well, I was hoping to have these finished for my mother in time for Mother’s Day, but it looks like that’s not going to happen. I mean, I could very well finish them before Mother’s Day, but I won’t be able to ship them off to her in a timely fashion. Grrr. I swear I was flying through the cuff, but then I slowed down while working the gusset decreases. I knit the foot in one sitting, and I just finished the toe earlier today. Not too shabby, speed-wise, I’d say. *sigh* I cast on for the second pair, but I doubt I will finish it before Thursday, what with all the stuff I need to finish for my next shop update and all. Oh well, I think she will appreciate a belated gift if it looks like this. P.S. – More about this pattern in the FO post…. P.P.S. – I am seriously worried that I may not have enough yarn to finish the second sock. Yikes! 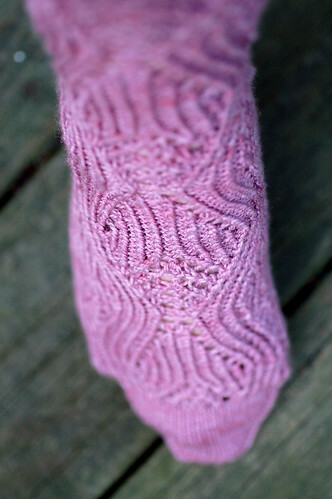 If anyone has any leftover Sundara Sock Yarn in Orchid, please contact me. I’m willing to buy it off you, pay for postage, etc. I clearly don’t need a whole skein of it, so really, scraps/leftovers will do me just right.